Olivier Boscournu is the winner of the Render of the Week Award for the week of May 14, 2012. Other than Yafaray, Olivier has succeeded in duplicating his convincing "Bidirectional Interior with Yafaray" scene in BI and Cycles as well. What difference did he discover in using all these Blender's three major render engine? Olivier has the following observation to share. The following article may not reflect the official view of www.BlenderNews.org.—Editor in Chief. Blender is a free 3D software package and is ideal for small studios or freelance CG artists who need to provide cost-effective and quality 3D renders. Still in development, the new Cycles render engine has been integrated since the 2.61 version, with GI render and GPU support. Still young, it offers a Pathtracing method which is very effective for outdoor rendering or a render for open stages where light spreads easily. For interior renderings, I usually work with Yafaray, which is very easy to configure and offers several lighting solutions, but it only calculates with CPU. I named this picture "Bidirectional Interior," because it was rendered with the Bidirectional Pathtracing method of Yafaray. Having never tried this, I decided to test it to see its performance. This unbiased solution is relatively slow, even if we take it into account that it's being rendered just by CPU. I also wanted to compare the Blender Internal to check if it's able to perform for an indoor scene. With no add-on required and easy to use, it's more ideal for beginners. It's suitable for product/studio rendering, similar to Direct Lighting of Yafaray and Cycles, where Global Illumination and light bounces are not useful. To accentuate the realistic, BI offers two solutions for ambient occlusion, an approximate and raytraced one. The latter is a little bit slower but is also more precise, it is this that I used for this scene. The materials are typically configured, without going through the nodes but by using multiple channels and different textures. Two lights illuminate the room, a lamp into the lamp and an area on the right to simulate the light from a window. It is important to increase the samples of lamps for soft shadows. The more complicated with the internal is to simulate the bounce light. Fortunately, it is possible to make many different passes that are very useful in post-production. My favorite! Its greatest advantage is the ease of use in configuring the engine and materials. The speed of Photon Mapping is quite impressive, and the Direct Light method is faster than that of BI. Six different shaders seem to be short but you can configure most of the needed materials for an interior rendering. 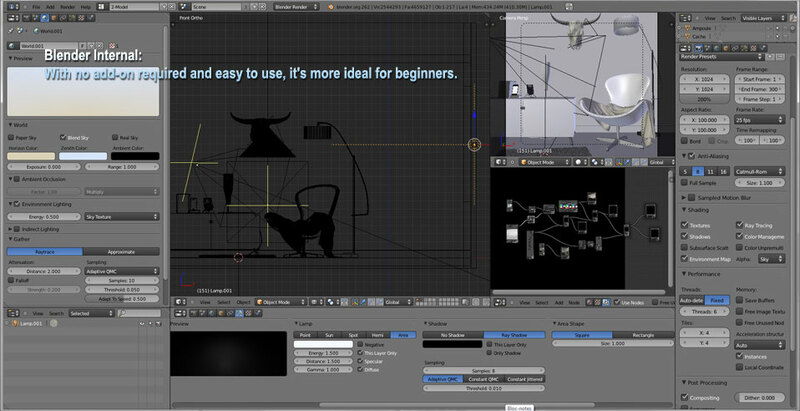 For me, Yafaray is a free "Vray" even if it doesn't provide as many render passes. 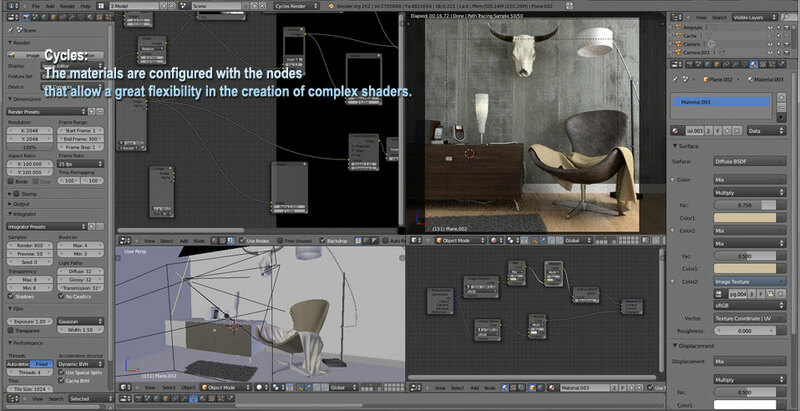 I use Cycles very rarely, except for projects involving furniture design, where the real-time preview is very practical. Unbiased calculation is rather long with the CPU, so it is imperative to have a good GPU, preferably with Nvidia Cuda, to take full advantage of the acceleration to reduce the rendering time significantly. 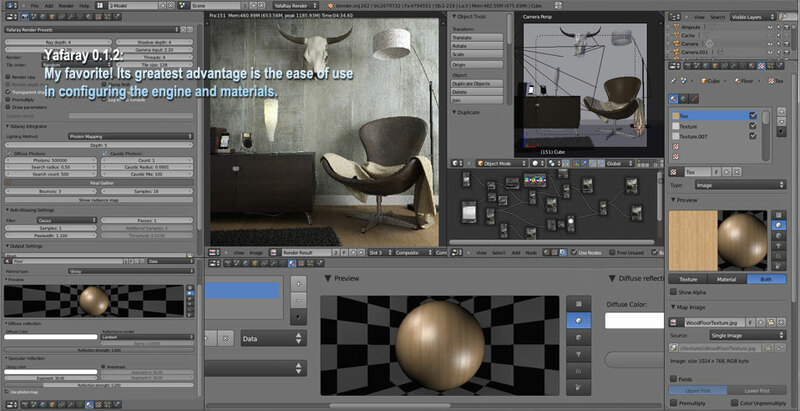 The materials are configured with the nodes that allow a great flexibility in the creation of complex shaders.